Wowsers! We posted FOUR episodes in one month — I assure you this is not the future of the podcast. In this episode we are taking another look at Godzilla vs Hedorah for the podcast – this time in the form of our Daikaiju Re-Discussion, which is a year-long series of films that we looked at really early in the life of the podcast and we’re giving some of our newer listeners the opportunity to comment on these movies before the format is changed and we reboot the process entirely. This environmentally charged entry in the Godzilla series was originally covered in episode #16 when I had August Ragone on to discuss the classic tokusatsu television series Ultra Q. 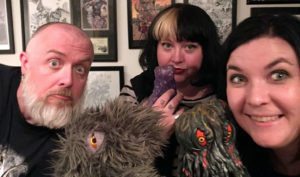 The Hedorah discussion was tacked onto the end of that episode, so I’m pleased to give this movie another “full episode” shot this month — and if you haven’t checked it out yet, we recorded a pretty great commentary on the film too! Tsuburaya Wins Court Case Against Chaiyo! Matt Frank’s Redman: The Kaiju Hunter Comic arrives next month! Legend of the Buddha Big Announcement coming soon! If you’d like to purchase one of our “footprint” enamel pins, you can do so here. 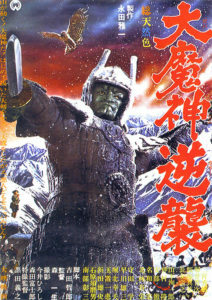 Our film for June is Wrath of Daimajin (1966), the THIRD film in the Daimajin trilogy — this is the one with the kids crossing Majin’s mountain (we don’t want anyone to get confused and submit a review of the wrong film). If you’d like to take part in the re-discussion episode, make sure you submit your homework (aka your thoughts, questions and reviews) before June 25th – thanks!